Jefferson Airplane was the first of the San Francisco psychedelic rock groups of the 1960s to achieve national recognition. Although the Grateful Dead ultimately proved more long-lived and popular, Jefferson Airplane defined the San Francisco sound in the 1960s, with the acid rock guitar playing of Jorma Kaukonen and the soaring twin vocals of Grace Slick and Marty Balin, scoring hit singles and looking out from the covers of national magazines. They epitomized the drug-taking hippie ethos as well as the left-wing, antiwar political movement of their time, and their history was one of controversy along with hit records. Their personal interactions mirrored those times; the group was a collective with shifting alliances, in which leaders emerged and retreated. But for all the turmoil, Jefferson Airplane was remarkably productive between 1965 and 1972. They toured regularly, being the only band to play at all the major ’60s rock festivals — Monterey, Woodstock, even Altamont — and they released seven studio albums, five of which went gold, plus two live LPs and a million-selling hits collection that chronicled their eight chart singles. Rather than formally breaking up, they mutated into other configurations, Hot Tuna and Jefferson Starship, and went on to further success in the 1970s and ’80s, before reuniting for an album and tour in 1989. The initial idea for the group that became Jefferson Airplane came from 23-year-old Marty Balin (born Martyn Jerel Buchwald in Cincinnati, OH, January 30, 1942), a San Francisco-raised singer who had recorded unsuccessfully for Challenge Records in 1962 and been a member of a folk group called the Town Criers in 1963-1964. With the Beatles-led British Invasion of 1964, Balin saw the merging of folk with rock in early 1965 and decided to form a group to play the hybrid style as well as open a club for the group to play in. He interested three investors in converting a pizza restaurant on Fillmore Street into a 100-seat venue called the Matrix, and he began picking potential bandmembers from among the musicians at a folk club called the Drinking Gourd. His first recruit was rhythm guitarist/singer Paul Kantner (born Paul Lorin Kantner in San Francisco, CA, March 17, 1941), who in turn recommended lead guitarist/singer Jorma Kaukonen (born Jorma Ludwik Kaukonen in Washington, D.C., December 23, 1940). Balin, who possessed a keening tenor, wanted a complementary powerful female voice for the group and found it in Signe Toly (born Signe Ann Toly in Seattle, WA, September 15, 1941). The six-piece band was completed by bass player Bob Harvey and drummer Jerry Peloquin. The group’s unusual name was suggested by Kaukonen, who had once jokingly been dubbed “Blind Thomas Jefferson Airplane” by a friend in reference to the blues singer Blind Lemon Jefferson. Jefferson Airplane made their debut at the Matrix on August 13, 1965, and began performing at the club regularly. They attracted favorable press attention, which — at a time when folk-rock performers like Sonny & Cher, We Five, Bob Dylan, the Byrds, the Beau Brummels, and the Turtles were all over the charts — led to record company interest. By September, Jefferson Airplane was being wooed by several labels. At the same time, the band was already undergoing changes. Peloquin was fired and replaced by Skip Spence (born Alexander Lee Spence, Jr. in Windsor, Ontario, Canada, on April 18, 1946; died in Santa Cruz, CA, April 16, 1999). Spence considered himself a guitarist, not a drummer, but he had some drumming experience. Also in September, Signe Toly married Jerry Anderson, who handled lights at the Matrix, becoming known as Signe Anderson. In October, Harvey was fired and replaced by Jack Casady (born John William Casady in Washington, D.C., April 13, 1944), a friend of Kaukonen’s. On November 15, 1965, this lineup — Balin, Kantner, Anderson, Kaukonen, Spence, and Casady — signed to RCA Victor Records. They had their first recording session in Los Angeles on December 16, and RCA released their debut single, Balin’s composition “It’s No Secret,” in February 1966; it did not chart. Meanwhile, Jefferson Airplane began to appear at more prestigious venues in San Francisco and even to tour outside the Bay Area. In May 1966, Anderson gave birth to a daughter, and caring for the child while performing with the band became a challenge. Meanwhile, Spence became increasingly unreliable as his appetite for drugs increased, and he was replaced in June by session drummer Spencer Dryden (born Spencer Dryden Wheeler in New York, April 7, 1938; died in Petaluma, CA, January 11, 2005). Spence went on to form the band Moby Grape. Following a second non-charting single, Balin and Kantner’s “Come Up the Years,” in July, Jefferson Airplane released their debut LP, Jefferson Airplane Takes Off, on August 15, 1966, just over a year after the band’s debut. The album had modest sales, peaking at only number 128 during 11 weeks on the Billboard chart. (A third single, Balin and Kantner’s “Bringing Me Down,” was released from the album, but did not chart.) At this point, Anderson’s commitment to her family caused her departure from the group. Jefferson Airplane was able to find a strong replacement for her in Grace Slick (born Grace Barnett Wing in or near Chicago, IL, October 30, 1939), the lead singer for the San Francisco rock band the Great Society, which happened to be in the process of breaking up at the same time. Slick joined Jefferson Airplane in mid-October 1966, and by the end of the month was with them in the recording studio. She brought with her two songs from the Great Society repertoire: the rock tune “Somebody to Love,” written by her brother-in-law Darby Slick, the Great Society’s guitarist, and her own composition, the ballad “White Rabbit,” set to a bolero tempo, which used imagery from Alice in Wonderland to discuss the impact of psychedelic drugs. Both songs were recorded for Jefferson Airplane’s second album, Surrealistic Pillow. RCA did not release either of them as the advance single from the album, opting instead for the departed Spence’s “My Best Friend” in January 1967; it became the group’s fourth single to miss the charts. Surrealistic Pillow followed in February. It debuted in the charts the last week of March, and its progress was speeded by the release of “Somebody to Love,” the first Jefferson Airplane single to feature Grace Slick as lead vocalist. By early May, both the album and single were in the Top 40 of their respective charts; a month later, both were in the Top Ten. With that, RCA released “White Rabbit” as a single, and it too reached the Top Ten. Surrealistic Pillow became Jefferson Airplane’s first gold album in July. Meanwhile, the band, which, naturally, had attracted national media attention (much of it focusing on Slick’s photogenic looks), began recording a new album and continued to tour. On June 17, 1967, they performed at the Monterey International Pop Festival, which was celebrated for introducing many of the new San Francisco rock bands (as well as the Jimi Hendrix Experience) and launching the “Summer of Love” that the season was touted to be in 1967. Jefferson Airplane’s performance was filmed and recorded. Two songs from their show, “High Flying Bird” and “Today,” were featured in the documentary film Monterey Pop, released in 1968. The concert recording was heavily bootlegged and over the years has turned up on numerous gray-market releases as well. 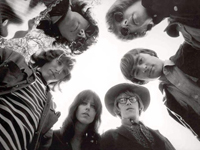 The nature of Jefferson Airplane’s commercial breakthrough, and the nature of the band itself, restricted their commercial appeal thereafter. AM Top 40 radio, in particular, became wary of a group that had scored a hit with a song widely derided for its drug references, and Jefferson Airplane never again enjoyed the kind of widespread radio support they would have needed to score more Top Ten hits. At the same time, the group did not think of itself as a hitmaking machine, and its recordings were becoming more adventurous. Kantner’s “The Ballad of You and Me and Pooneil,” the band’s new single released in August, featured him as lead singer with Slick and Balin harmonizing. It reached number 42 on the strength of the band’s prominence, but they never again crossed the halfway mark in the Hot 100. At the same time, the rise of FM radio, attracted to longer cuts and the kind of experimental work the group was starting to do, gave them a new way of exposing their music. Nevertheless, their third album, After Bathing at Baxter’s, its songs arranged into lengthy suites, was not as successful as Surrealistic Pillow when it appeared on November 27, 1967, reaching the Top 20 but failing to go gold. Also notable was the diminished participation of Marty Balin, who co-wrote only one song, and now was being marginalized in the group he had founded. After Kantner’s “Watch Her Ride,” released as a single from After Bathing at Baxter’s, stalled at number 61, RCA released a new Jefferson Airplane single written and sung by Slick in the spring of 1968. But radio was even more resistant, and “Greasy Heart” stopped at number 98. It was included in the band’s fourth album, Crown of Creation, released in August. The title track got to number 64 as a single, and the LP, which featured more concise, less experimental tracks than After Bathing at Baxter’s, marked a resurgence in the group’s commercial success, reaching the Top Ten and eventually going gold. Jefferson Airplane’s live appeal was chronicled on the concert album Bless Its Pointed Little Head, released in February 1969. In August, the group appeared at the Woodstock festival, and it was featured on the million-selling triple-LP soundtrack album to the resulting film in 1970, though it did not appear onscreen in the version initially released. The band’s fifth studio album, Volunteers, appeared in October 1969 as its title song became a minor singles chart entry. Volunteers stopped short of the Top Ten, but it went gold in three months. On December 6, 1969, the band played at the Rolling Stones’ disastrous Altamont free concert in California, its performance (complete with Balin’s beating at the hands of Hell’s Angels) captured in the 1970 documentary film Gimme Shelter. Jefferson Airplane did not have a new album ready for release in 1970, and RCA filled the gap with a compilation, sarcastically dubbed The Worst of Jefferson Airplane and released in November. The album went gold quickly and was later certified platinum. Issued on its heels was Paul Kantner’s debut solo album, Blows Against the Empire, featuring most of the members of Jefferson Airplane as well as various other musical friends. Due to that long list of sidemen and the album’s science fiction theme about a group of hippies hijacking a spaceship, Kantner co-billed the disc to “Jefferson Starship.” As yet, there was no such entity, but Kantner would use the name for a real band later. Having completed their recording commitment to RCA, Jefferson Airplane shopped for a new label, but was wooed back when RCA offered them their own imprint, Grunt Records. Grunt bowed with the release of the sixth Jefferson Airplane studio album, Bark, in August 1971. The album stopped just short of the Top Ten and quickly went gold. Covington, Casady, and Kaukonen’s “Pretty as You Feel,” later issued as a single, gave the band its final placing in the Hot 100 at number 60 early in 1972. Grunt issued albums by bandmembers including Creach and Hot Tuna, as well as discs by friends, but Jefferson Airplane remained its most successful act. In the early ’70s, the members of Jefferson Airplane became increasingly preoccupied by their side projects. Hot Tuna, having issued a second live album, First Pull Up, Then Pull Down, in the spring of 1971, put out their first studio effort, Burgers, in February 1972. Kantner and Slick, who had become a couple and had a child, China Kantner (who went on to be an MTV VJ in her teens), issued a duo album, Sunfighter, in December 1971. In April 1972, Covington left the band and was replaced by veteran drummer John Barbata (born in Passaic, NJ, April 1, 1945), formerly a member of the Turtles and a backup musician for Crosby, Stills, Nash & Young. The group then recorded its seventh studio album, Long John Silver, which was issued in the summer of 1972. It reached the Top 20 and went gold within six months. For the accompanying tour, they added singer/multi-instrumentalist David Freiberg (born in Boston, MA, August 24, 1938), formerly a member of the San Francisco rock band Quicksilver Messenger Service, to provide the male lead vocals formerly sung by Balin. The tour concluded at the Winterland ballroom in San Francisco on September 22, 1972, in effect marking the end of Jefferson Airplane, although no formal announcement was ever made. Kaukonen and Casady went back to performing as Hot Tuna. Kantner, Slick, and Freiberg recorded a trio album, Baron von Tollbooth & the Chrome Nun, issued in the spring of 1973 and featuring the rest of Jefferson Airplane as side musicians. Slick’s debut solo album, Manhole, issued in early 1974, also featured many of the same performers. Kantner and Slick then organized a new band along the same lines as Jefferson Airplane, but without Kaukonen and Casady, and called it Jefferson Starship. Meanwhile, a second Jefferson Airplane live album drawn from the 1972 tour, Thirty Seconds Over Winterland, was issued in the spring of 1973. Early Flight, a collection of stray tracks, appeared in the spring of 1974. Grunt issued the compilation Flight Log (1966-1976) at the start of 1977, filling the two LPs with tracks by Jefferson Airplane, Jefferson Starship, and various other spinoff acts. 2400 Fulton Street: An Anthology, named after the address of a house owned by the band in the 1960s, was a two-disc set released in 1987. All of these albums sold well enough to reach the charts.